Magmortar. Fourth generation fire type Pokemon. Their seems so real. Cool art! "Who wants to die first?" At first I was like, "well, that's nice, but what's with the blurring? It makes it look kind of sloppy." Then I kept looking and was like, "oh, it's because it's showing the heat! That's awesome!" can i use for a fake card? Did you do that for the heat? My brother really likes this pokemon. I think it's his love of cannons. He loves Blastoise too, go figure. Omg I love his cannon arm. What program did you use to make this?! Yeah I really like this! Great perspective as a lot of people have already mentioned, and I think your use of light is really good too... I love the coloring and shadows on Magmortar! Anyway, really great work! ACK!!! I wasn't really paying attention, and this made me jump! nice Great job with the background. Amazing perspective! 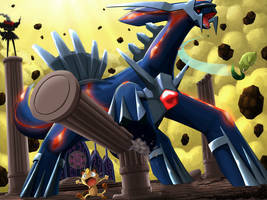 I love how the Magmortar is the focus, yet theres still stuff going on in the background. The crowd and the trainer in the background add so much the the picture. I love it all around!